Dental imaging is a process of creating a high quality images for the diagnosis of dental problems. Dental imaging technologies aids the dentists to diagnose dental diseases by providing actual and visual images of the dental problems such as hidden dental structure, cavities, bone loss, and oral malignant melanoma. Radiography is a imaging modality and diagnostic tool which assists in clinical examination of dental problems. Radiographs are made with image sensor technologies such as Cone Beam Computed Tomography (CBCT), panoramic, cephalometric, and intra-oral dental imaging. Dental cone beam computed tomography is a special type of X-ray machine, which is being used instead of regular dental or facial X-rays. This report identifies the global Dental Imaging Market size in for the year 2014-2016, and forecast of the same for year 2021. 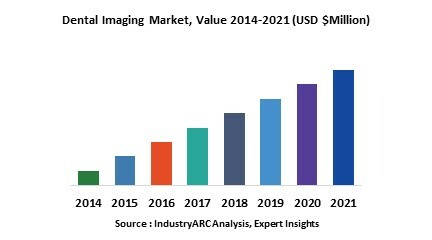 It also highlights the potential growth opportunities in the coming years, while also reviewing the market drivers, restraints, growth indicators, challenges, market dynamics, competitive landscape, and other key aspects with respect to Dental Imaging Market. Geographically North America dominated global Dental Imaging Market, and is projected to have fastest growth, owing to Exclusive distribution agreement between digital sensor manufacturers and major distributors for digital dental imaging instruments market in the United States. 16.5. Sirona Dental Systems, Inc.
16.10. The Yoshida Dental Mfg. Co., Ltd.
Table 38 " Dental Imaging Market By End Use, Revenue & Volume, By Forensic Labs, 2018-2023 ($)"